During 2014 and 2015 a renovation was undertaken -- though restoration might be a better word -- of St. Joseph's Chapel at Kenrick-Glennon Seminary in St. Louis, Missouri; another project coming from McCrery Architects. 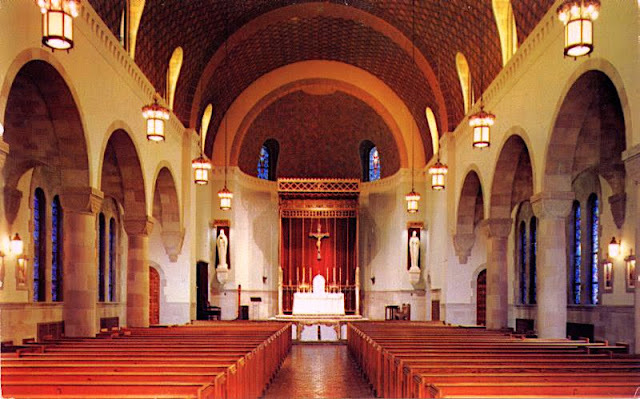 The project included a new altar, ambo, ciborium and pipe organ, as well as the painting of the apse and chapel ceiling. The new painted details include not only a heavenly canopy of stars and sunbursts, but also damasked wall patterns. 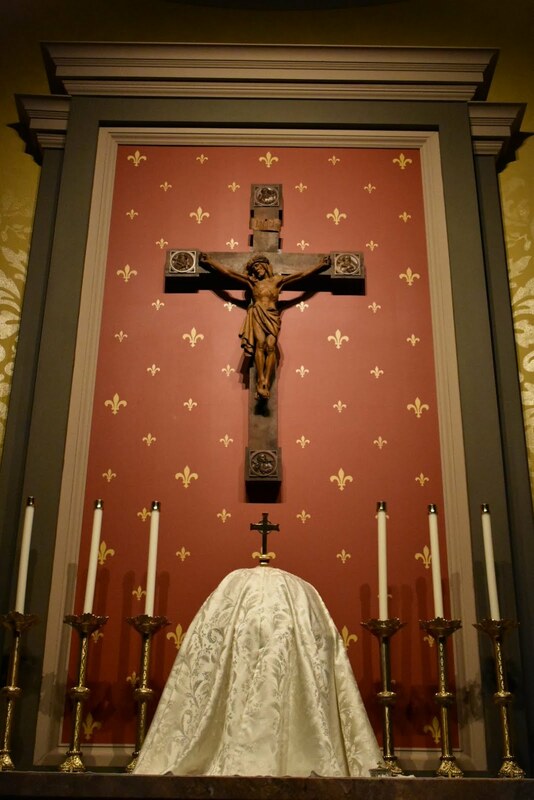 Before we begin our consideration it is worth looking at the pre-conciliar form of this chapel as this is always a point of great and understandable curiosity. As you can see, it was quite a noble chapel, noticeably influenced by the 20th century Liturgical Movement. Certainly it was indicative of Roman noble beauty and simplicity and you will also note -- though the resolution of this photograph doesn't show it well -- the stencilled ceiling that was originally found here. As the story has so often gone these past few decades, following the Council various renovations were undertaken. 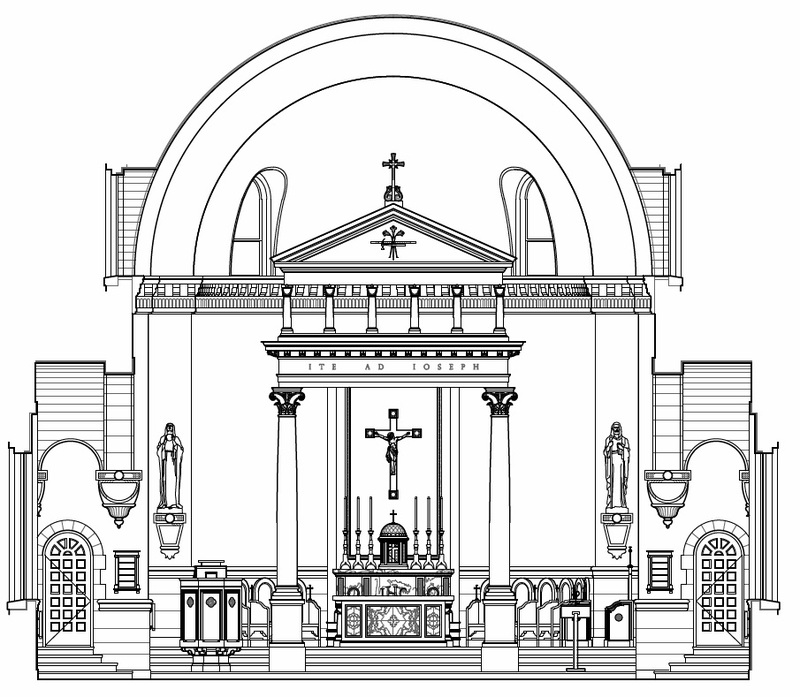 Shown below is the post-conciliar sanctuary as it stood immediately prior to the current project. You will note that the ceiling was painted over with a plain colour. The original high altar with its canopy was removed from the sanctuary at some point and replaced by a freestanding altar. A metallic, ciborium like frame structure was present, though it was oddly placed over the tabernacle rather than the altar itself -- though it was really more the bones of a ciborium than a ciborium proper. 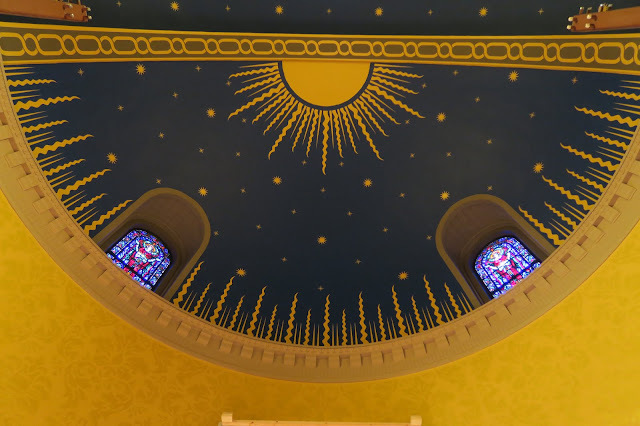 When comparing the two views above, one will note how the loss of the stencilled and darker coloured ceiling left the chapel feeling rather ungrounded -- even a bit dingy. Fortunately this was remedied in the recent renovation/restoration. 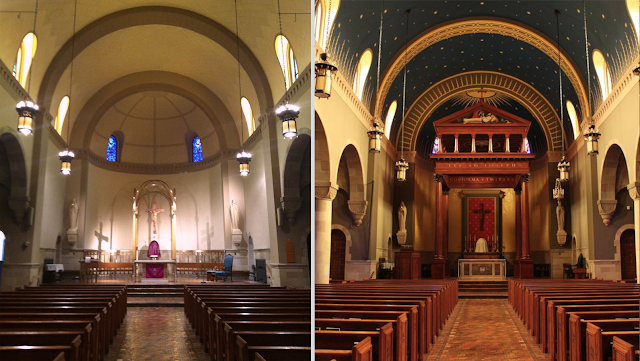 Before we show the completed views however, here are McCrery's architectural designs showing the new sanctuary. In this view one will get a good sense of the new and restored elements. One will particularly note the ciborium designed here and the high altar. 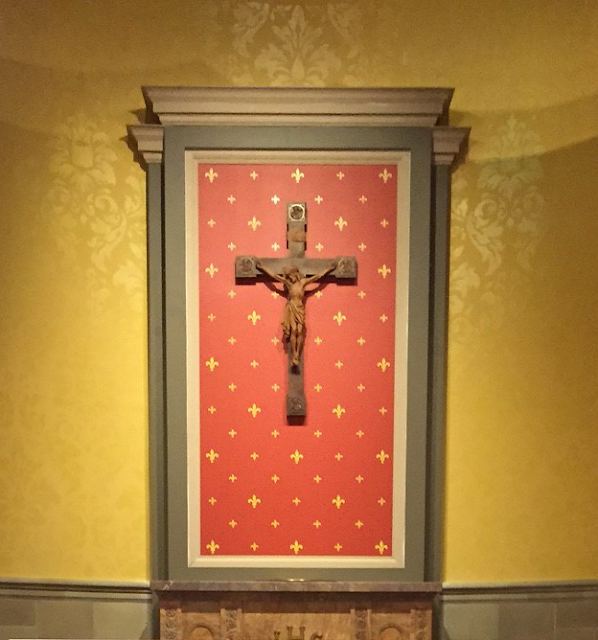 As well, something approximating the original high altar -- sans canopy of course -- has been placed behind as an altar of reservation. One will also take note of the new, more substantial ambo. Image: Copyright (c) McCrery Architects. In every regard this is a triumph. 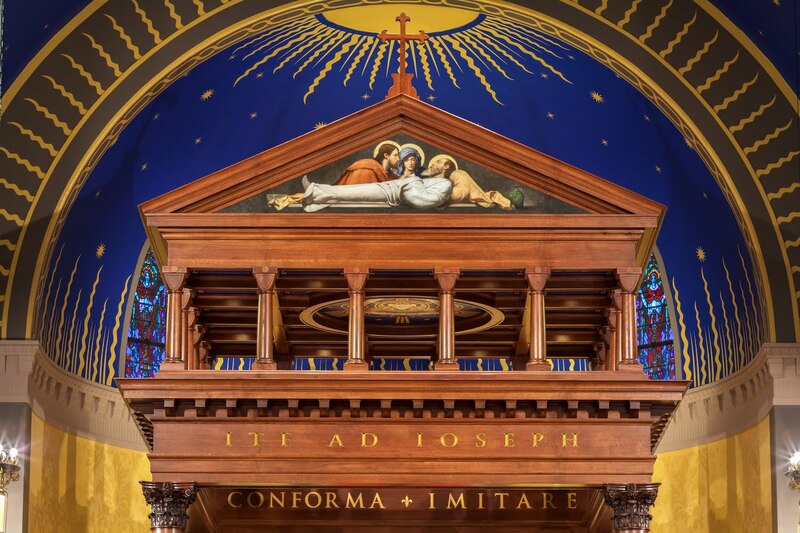 Not only are the colours more inviting, giving greater substance and life to the chapel (not to mention iconographic symbolism), the ciborium fulfills its task of drawing attention to the high altar. The red back-drop also accentuates the wall crucifix, tabernacle and altar proper. 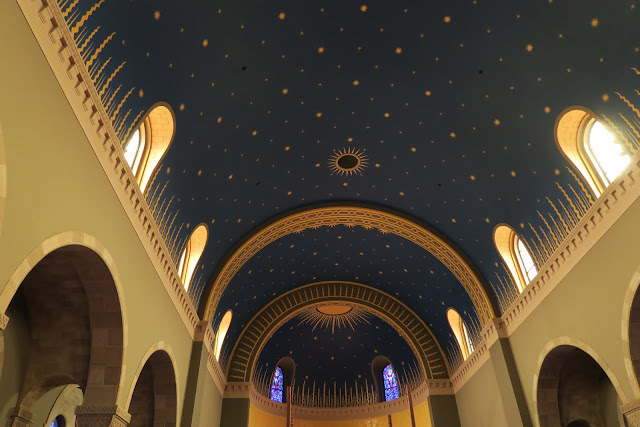 The deep blue tones of the apse and ceiling, penetrated with their golden designs, as well as the damask patterns on the sanctuary walls, are warm and inviting, as is the wood utilized for the ciborium, and add layers of visual interest. All of these elements draw one into the chapel. 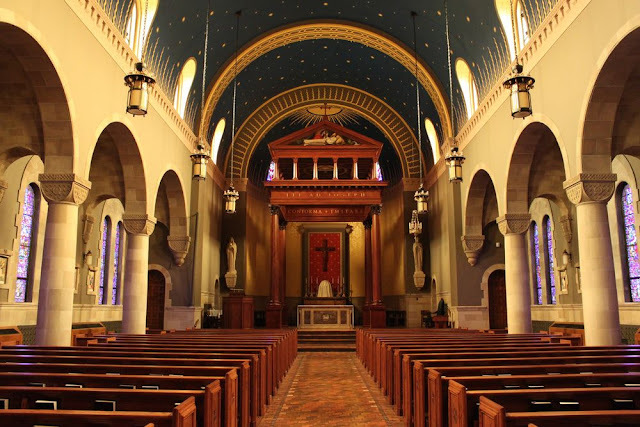 It is also worth noting that the new arrangement has the effect of making the sanctuary more orderly and less cluttered than it was in its previous incarnation, restoring the original Roman simplicity that it had also in its preconciliar version. Naturally there will be a desire to consider the new chapel also in view of the former preconciliar chapel but even here I would suggest that the new chapel is actually an improvement over the preconciliar version, expressing an even greater sense of Romanitas. 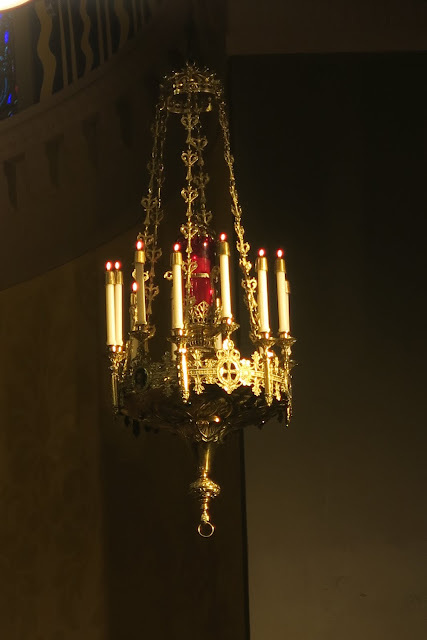 My own reasoning here has to do primarily with the ciborium, but also other details as well. 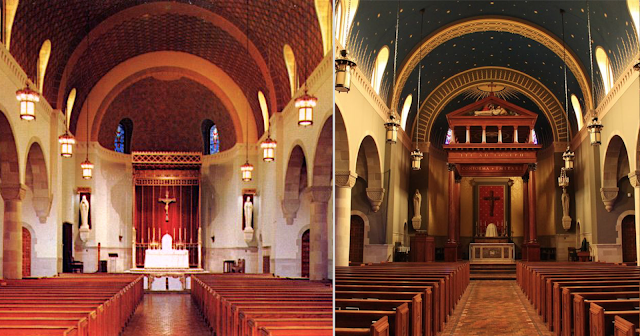 The colour palette of the new chapel looks preferable as well, however it is difficult to discern if that has more to do with the limitations of the vintage photography than what it actually looked like in real life. The only exception to this judgement would be my usual comment about the predella (which the preconciliar chapel, of course, had). 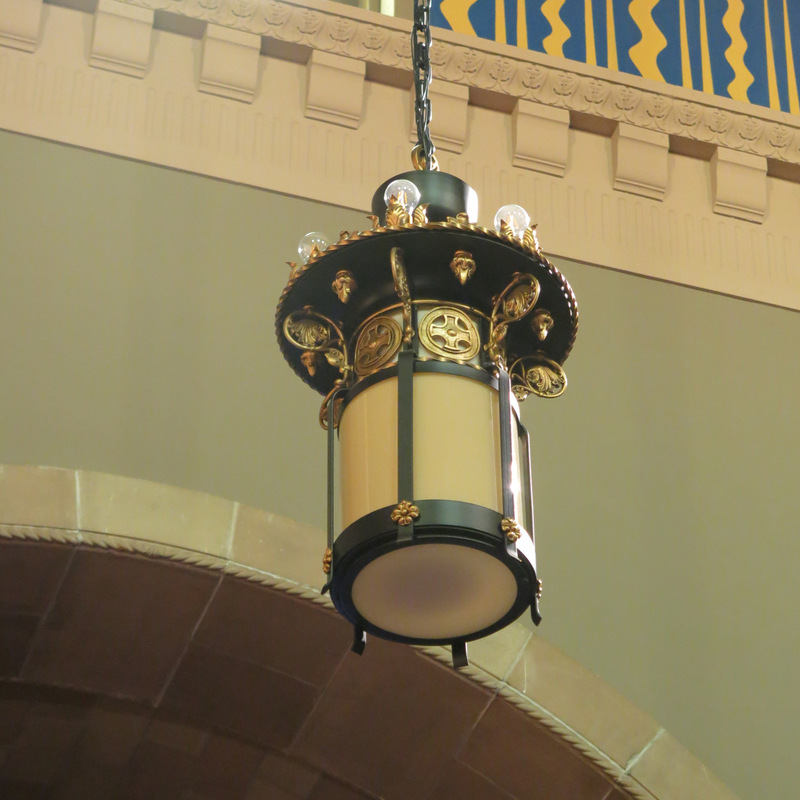 A detail of the ciborium which is especially focused on St. Joseph whose patronage the chapel is under. 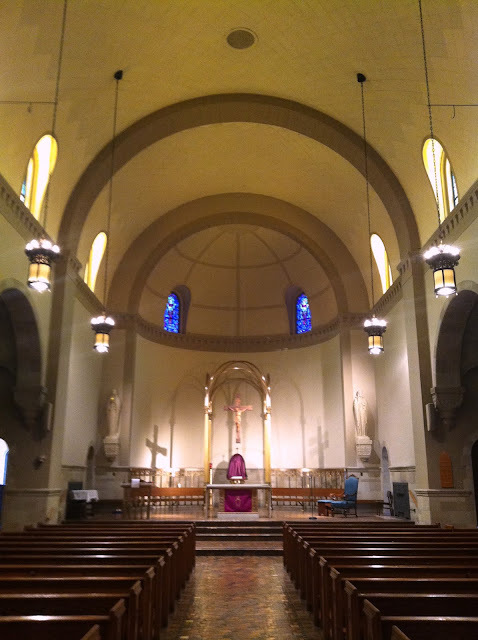 A photograph taken prior to the installation of the tabernacle and other ornaments, and prior to the consecration of the chapel. This provides you with a a sense of the gold on gold brocade patterns referred to earlier -- a really very admirable trait that we showed in another McCrery project. 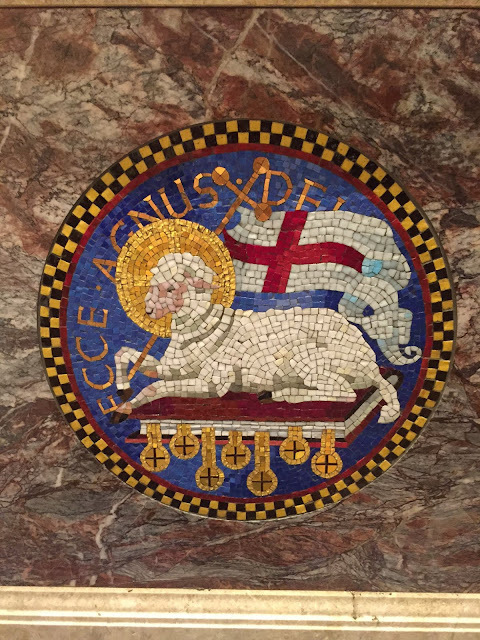 You will also get a good view here of the red painted space with gold stencilled fleur-de-lys and crucifix which visually approximate the former high altar of the preconciliar chapel. A very nice touch and one which draws one's attention ultimately toward the high altar. I'll say it again: a triumph. For further photos, please see the Kenrick-Glennon Seminary website.